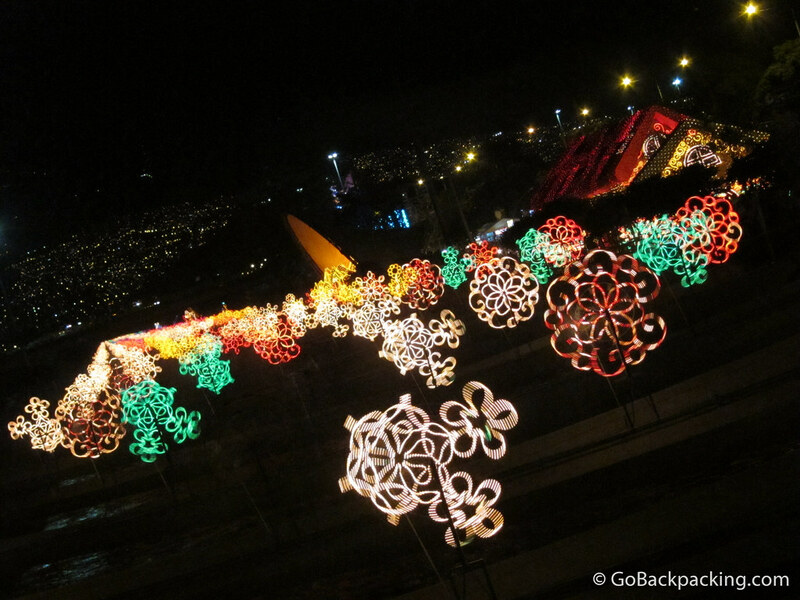 As I've shared on Medellin Living recently, Colombians go all out to celebrate Christmas, and the whole month of December for that matter. The action is centered around the Rio Medellin Christmas lights which run a long stretch of the river, starting just a few blocks from my apartment. This year, there are rotating pinwheels that change colors. They're all wired together and programmed to light up like dominoes along the river. The lights extend as far as the eye can see, so it creates an impressive effect. A road on one side of the river is temporarily closed to create a pedestrian area lined with even more holiday lights, and an endless number of food stalls. On a clear night, large crowds of friends, families and couples can be found enjoying the atmosphere, food, and holiday spirit. Nice pictures, seems like a great way to spend an evening and enjoy the holiday spirit! Thanks guys — I should post some video as well, it’s quite a site to watch the lights turn on and off as they go up and down the river. Great photo! I couldn’t manage to get a good shot of those spinning lights. What a great photo Dave! Wow, great photo, can’t imagine how it actually feels being there. I think “surreal” is the word that goes best here.